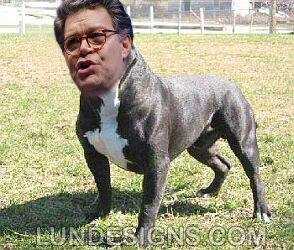 Could Al Franken become the first dog in the US Senate? Some aspiring politicians find Jesus, but Al Franken would have you believe he's had a conversion of his own, from Saturday Night Live goofball to Deadly Serious Issues Guy. He swears as much in a long, rambling video posted to his U.S. Senate campaign's web site. "I want you to know that nothing means more to me than making government work better for the working families of this state," says the wannabe senator, speaking before a bookshelf crammed full of undoubtedly important tomes. "And over the next 20 months, I look forward to proving to you that I take these issues seriously." In his down time, however, Franken is apparently still quite the class clown. At least that's according to several of his neighbors in a downtown Minneapolis luxury high-rise. They say the Stuart Saves His Family star exhibits endlessly zany behavior on the treadmill in the communal workout room. "He yells, 'Go Al!' and then puts his sweaty towel in his mouth, shakes his head back and forth, and growls like a dog," says Lauren Zeller, a 28-year-old risk consultant. "The cycle repeats: 'Go Al!,' towel, shake head, growl." Hilary Cheeley, a health care technology project manager, says she recently caught him yelling at the television during a Twins game. "When someone would strike out or whatnot he would say, 'Oooh!' or 'C'mon, hit it!'" says Cheeley, who is 32 and lives in the Grant Park condo building with her husband. "He was just kind of chatting up the TV while he was walking on the treadmill. I swear he was doing it just to get a rise out of me." He later put his towel in his mouth, "maybe to curb his yips and yells," she speculates. Cheeley had previously introduced herself to the chubby, ever-smiling Franken. She recognized him from Saturday Night Live and had listened to him on his erstwhile Air America Radio show. Months later, she says, he was extremely friendly when she "accosted" him in the lobby while he was walking his black lab, Kirby. But on a recent Sunday afternoon, Franken seemed to regress back to his days as an entertainer. "He had his earphones on and was singing out loud," Cheeley says, adding that the two were alone in the workout room. "I couldn't recognize the song. It put a big smile on my face and made me laugh, and I think that was intentional." Zeller wasn't quite so amused. She encountered Franken in the workout room once in April and once in late May or June, she says, and both times he was decked out in a white t-shirt, white socks pulled halfway up his calves, and white tennis shoes. Also on both of those occasions, he asked her to help him find C-SPAN on one of the televisions. "He said he watches a lot of C-SPAN because it's important to stay politically informed, or something along those lines," Zeller says. He then began what she describes as a "politician's run"—a light jog with a whole lot of swinging elbows—before commencing the "Go Al!" towel-biting routine. "It's clear that his activities in the gym are a performance, like a Saturday Night Live skit gone wrong or something," she says. "I think I felt mostly annoyed. When you're the only other person in the gym, it's hard to ignore. I actually left early so that I wouldn't have to see the growling and cheering himself on!" In any case, Franken's oddball behavior seems well known around the building. Cheeley and Zeller report that two other residents have also had strange encounters of the Franken kind, although neither responded to City Pages' request for comment. "My friend said a half a year ago or so that he was down there lifting weights, kind of pep talking himself, like 'C'mon Al, you can do one more rep!'" says Cheeley. To answer the Big E’s question: No, it doesn’t signal a rightward turn, as should be evident by this week’s feature story, which is plenty critical of several prominent local Republicans. The artist, Jay Bevenour, lives in Philadelphia, PA. The writer, Ben Westhoff, lives in Brooklyn, NY. Westhoff mentions way at the end (the last paragraph) that his main source is a Republican. I consider this barely mentioning that his source is more than likely politically motivated and completely disingenuous. Westhoff claims to be a Democrat and typically writes music reviews for the Village Voice. From his debut political article, he sounds like a Joe Lieberman Democrat. The VV and CP are owned by the same media corporation, Village Voice Media. Even if Franken's Hollywood supporters succeed in spinning this issue, the question remains: is Stuart fit for office? In his defense, it isn't a particularly sane political chamber and Franken's yipping might liven up particularly boring policy debates. However, something tells your Radio Equalizer there will be more revelations to come. FOR Boston- area talk radio updates, see our other site. New: big developments in the local sports-talk saga, Dennis & Callahan humiliated by Entercom! I'm no Al Franken fan by any stretch of the imagination but yelling back at a TV screen during a sporting event isn't that uncommon. I've seen it at sports bars, restaurants, gyms, homes, etc. It's no big deal. As to the towel biting, growling like a dog routine...that's a little off-kilter I admit but no weirder than some workouts I've witnessed at gyms in my lifetime. I think this is a little bit overblown. Franken is and always will be an entertainer and I am willing to bet that he's willing to do almost anything to get a laugh out of someone including acting the fool. As a local Minnesotan, I certainly hope his desire to get a laugh and act like a fool continues. It will be a lot easier to put up with his antics for just the next year of campaigning than 6 years in office. Do you know I can read your entire post from within the little window that opens from my Google reader widget that is on my iGoogle homepage? Essentially this means I and anyone else can bypass the advertising on your website. I contrast this with other blogs where I only receive a "teaser" - just a few lines forcing me to click the link to go to their website. I can't believe this is desirable or intended by you. I suggest you do something about it. Like many entertainers, Al Franken has a tremendous ego. However, unlike many entertainers, he does not have the talent to justify such an ego. He works very hard just to be mediocre. I listened to damn near every one of his radio shows since Nov '04 up until he went off the air. I never noticed any improvement in the quality of the show during its run. The only time the show made me laugh was when one of his guests would upstage him by being funnier than Al (which was no tremendous feat). He would always say "Hey! I make the jokes on this show!" He would try to say it lightheartedly, but you could tell he was irked. If he gets elected to the Senate, it will be more of the same. He will always be doing things to try to draw attention to himself in order to feed his ego. And as always, he will look more foolish than anything else. mmmmml. Benson, thats how you con crackpots sold Bush "the guy who can tell a joke and share a beer with", remember that?????? remember that "Kerry is not the guy you could drink a beer with"? Funny how cons constantly switch their ideas, like night and day. Acting "regular" was good for Bush, but bad for Franken??? Love how cons work, it's astonishing hypocracy. Mopette, your logic is so twisted, it puts a pretzel to shame. Bush: "the guy who can tell a joke and share a beer with"
There's nothing wrong with a person who is sociable and enjoyable to hobnob with. Kerry: "is not the guy you could drink a beer with"
That's because Kerry will only drink expensive French white wine with other high-brow, name-dropping, smarty pants, self-indulgent effete snobs. I'm not hypocritical on this issue. There is no way I would ever want to have a beer with Franken. He is not sociable (unless you are a rich Hollywood star). He is arrogant and imbecilic. 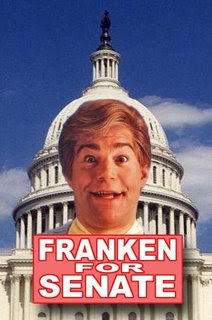 Of course, Mopette blindly supports Brother Franken. That's because all of the loony far left-politicians act just like Franken. There is no way anyone, not even you, could believe that crazy Al Franken acts like Joe Public!